Back in late 2009, some ministerial colleagues and I were discussing with concern the apparently growing influence of evolutionary thinking in the Canadian Reformed Churches. What could we do about it? Five of us decided to collaborate on an article, “Ten Reasons Why Evolution is Dangerous and Evil.” Authored by Walter Geurts, George van Popta, John van Popta, Jim Witteveen and yours truly, this was published in the January 1, 2010 issue of Clarion. You can find it online here. At the beginning of March 2010, an 11-part series of responses began to be published on the Reformed Academic blog. It’s not my intent to interact with those responses as such. Rather, I want to point out one particular point of response. It relates to something I’ve read more recently. One of the “ten reasons” was that “Evolution must regard Genesis 2:8 as mythical.” Rev. John van Popta argued that the creation of Adam was a special act of God. Adam was created from literal dust as the first human being. Genesis 2:8 gives us history, not myth or allegory. In their response, Reformed Academic (RA) insisted they agree: “We fully affirm the main point of this paragraph, namely that man is a special creation.” They pointed that there are those who “lend credence” to the theory of common ancestry who also affirm “the clear Biblical teaching of the soul, and that the human person is made uniquely and specially in the image of God.” RA maintained that they do not join with those who regard Adam as a-historical. At first glace, all of this may seem quite palatable and encouraging. What was sometimes not recognized in the early stages of this debate was that some words were being used equivocally. What we meant by “Adam as the first human being created specially by God from the dust in history,” did not necessarily mean the same thing as what they meant by that. People can say that and yet lend credence to the theory of common ancestry. One way is by positing the existence of pre-Adamite hominids. These are human-like creatures supposed to have existed before and with Adam. There could have been hundreds of generations of these hominids which had evolved over millions of years. But no human beings! No, Adam is still the first human being. God selects a pair of hominids, pulls them out of their lowly origins (“dust”), and bestows on them his image. At that point, they become human beings with souls. It’s important to realize: in this view, this really happens at some point in history. So everything is preserved intact: the possibility of biological macro-evolution (common ancestry), Adam as the first human being specially created by God in his image, and Genesis as an actual historical record. 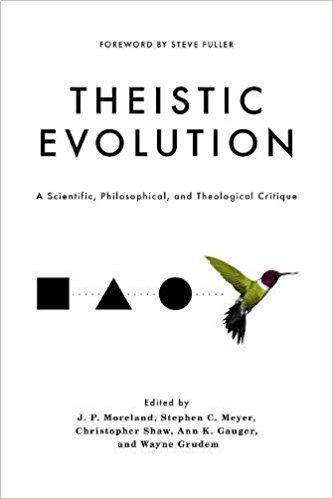 In the thick tome Theistic Evolution: A Scientific, Philosophical and Theological Critique, Wayne Grudem has a 54-page essay entitled, “Theistic Evolution Undermines Twelve Creation Events and Several Crucial Christian Doctrines.” Grudem makes many valid points. However, I can imagine some theistic evolutionists reading it and offering a similar critique to what RA offered on some of our ten reasons. Let me mention a few examples. For another example, Grudem writes that proponents of theistic evolution state that “Adam and Eve were born from human parents.” Again, we could imagine an evolutionist protesting: “No, I don’t believe Adam and Eve came from human parents.” Hominid parents, perhaps, but definitely not humans. After all, Adam and Eve are the first human beings. We all agree on that! One more example: “Human death did not begin as a result of Adam’s sin, for human beings existed long before Adam and Eve and they were always subject to death.” “No, Dr. Grudem, with you I believe that human death came from the fall into sin in Genesis 3. There was no human death before Adam and Eve, because there were no human beings before them.” If we talk about hominid death, that’s a different topic, but not relevant in the theistic evolutionist’s mind. With us they can insist there was no human death before Adam and Eve. This is a significant weak spot in Grudem’s essay. Perhaps he hasn’t encountered these kinds of counter-arguments. It’s but one more demonstration that we need to be carefully dissecting these matters and not always taking everything at face value. Just because someone says they believe Adam and Eve to be real historical figures doesn’t mean they mean what you mean. You have to ask; you have to dig deeper. Just because someone says they believe Adam and Eve to be the first human beings doesn’t mean common ancestry/evolution is out of the question. You have to ask probing questions like: as a biological creature, was the individual later called Adam brought into physical existence by the meeting of a sperm with an egg? Or: as a biological creature, was the individual later called Eve ever nourished at the breasts of a creature which had given birth to her? Then you might find out what you’re really up against and be able to formulate arguments which will better get to the heart of the matter.